Most journalists aren’t aware of this, but “food deserts” in the United States are a hoax. 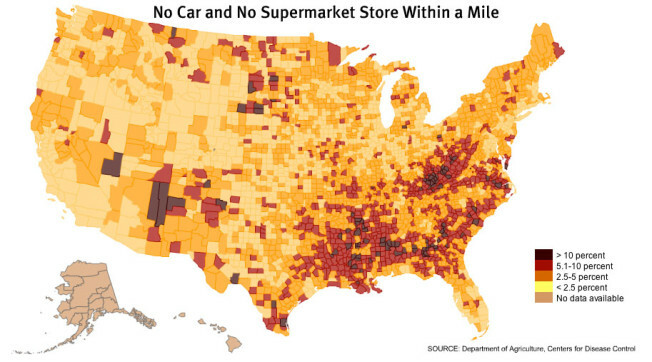 A food desert has been arbitrarily defined as an area in which at least 20 percent of the households have incomes that put them below the federal poverty line, before receiving any welfare benefits or considering public transportation options or the existence of grocery delivery services, where the nearest grocery store is more than a mile away in urban areas or more than 10 miles away in rural areas. What most journalists don’t realize is that the concept of a food desert originated with a study in 2006 funded by the LaSalle Bank of Chicago, which was then the largest business lender in the city. That’s important because, as a business lender, the bank would profit from the solutions most likely to be implemented by politicians seeking to rectify the “crisis”: building more grocery stores. In previous efforts to promote her “Let’s Move” campaign, First Lady Michelle Obama lauded mayors for easing zoning and permit requirements for grocery stores to move into food deserts. One of her stated goals of the program is “to bring grocery stores and other healthy food retailers to underserved communities all across the country.” Obama’s campaign to get people moving, increase awareness about nutrition and get farmers markets to disadvantaged areas was so politically safe—and universally accepted as necessary—that she remains easily one of the most favored public figures in this country, despite being married to one of its least. Locally, across several large metropolitan areas, efforts to move grocers and farmers markets near poor neighborhoods have often been met with wide acclaim. These were the rare policy options that worked in a free market system and helped increase quality of life for disadvantaged communities. Slam dunks, they seemed. But the evidence that grocers and farmers markets actually irrigate food deserts never came. In fact, the actual existence and mechanisms of food deserts have been questioned. The developing body of research has suggested over the past few years that while spatial access to groceries is a factor, economic and cultural access are more important. As Betsy Breyer, a researcher from Portland State University noted, “I don’t think the [food deserts] idea captures the full spectrum of food access possibilities and problems in poor communities.” In many cases, even building expensive stores directly next door to poor people, while solving the “food desert” issue from a definitional perspective, actually does little to help the underlying problem. Public perception and policy, however, have been retreating from the woefully inadequate but somewhat compelling conclusions about nutrition justice at an absolutely glacial pace. The conflict between public policy, perception and local facts and realities came to a head in national news when earlier this year residents of a once-predominantly black neighborhood in Portland successfully rallied against the building of a Trader Joe’s on a vacant lot in the area. Many folks were baffled. Why wouldn’t people in this place labeled as a clear food desert rejoice at the fact that they could get great groceries (and tasty cookie butter) right down the street? But what outside viewers and eager Traderites willfully ignored was that many citizens were deathly afraid of gentrification and being displaced from their own neighborhoods in a city well-known for aggressive gentrification, much of which had involved early incursions by large chain grocery stores. Breyer said that in the case of Trader Joe’s in Portland, the food desert concept was “used as an excuse to push an agenda that had nothing to do with food access for low-income communities” and had more to do with providing a rationale for securing access to cheap, promising real estate for developers and, eventually, the chain. The lower-income inhabitants of the neighborhood had figured out what policymakers and informed citizens across the country hadn’t: that the courtship dance with grocery stores was a dance with death for the people that needed the groceries most. The jig was up. Solving the “problem” of food deserts was never the point of the government programs supposedly established for the purpose of eliminating them. 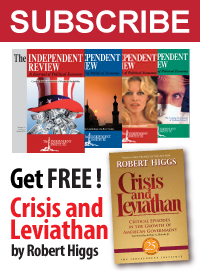 The purpose of these programs is and always have been to benefit the crony capitalist industrial complex of banks, real estate developers, and corrupt politicians. Never mind the interests of those who would rather not have their tax dollars fund such follies or see their already debt-burdened government borrow large amounts of money to solve problems that really never existed in the first place.